Would You Like A Raw Egg On That? No. No I would not. I would not like a raw egg dumped on top of my noodles, chicken, soup, rice, spaghetti, burger, fries, eggs or anything else. What is it with the raw eggs?! I think half the reason I am slowly starving to death is that every time I see something that looks like it might be good to eat I notice there is a raw egg dumped on top of it and I don’t know how to say “Please don’t dump a raw egg on it.” in Japanese. 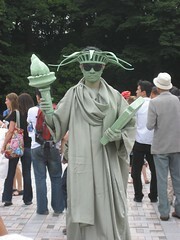 Anyway, yesterday I decided to head down to Yoyogi-Koen (Park) to see the freak show. Yoyogi-Koen is where Tokyo kids go on the weekend to be as weird as American kids are every day in school, and in church. In just one (admittedly large) park I saw a band called Zephyr (King of J-Rock! ), a beat box / rap guy, several emo bands, a bunch of guys dressed up like The Fonz doing some kind of weird 50s type synchronized line dance thing and combing their huge, greasy hair, a HUGE group of kids doing a synchronized dance, another HUGE group of kids in a giant circle all with the same camera just kind of standing there (I’m talking 100+ kids), a little play using green sheets for (I think) water where the two main actors alternately laughed and cried at the top of their lungs, goths, vamps, furrys, cos-play kids, The Statue of Liberty, hundreds of tiny dogs, the Free Hugs people, and lots and lots of vendors selling fried balls of mushed up octopus. Ginza was no different than any other big city main strip except it was perhaps more quiet and polite, and the street musicians were better. So then it was Yoyogi-Koen, as described above and in the videos below, and then I stopped off in Akihabara on the way home. Akihabara is the electronics district (it’s nickname is Electric City) and it’s awesome. There are skyscrapers that are nothing but floors and floors of electronics stores and it’s all pretty cheap. I didn’t notice any absurdly cheap prices compared to home, but I will guess that it was all as cheap as I’ve ever seen, at least. 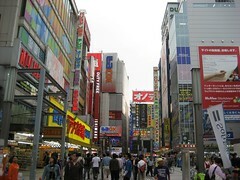 Akihabara is also supposed to be the home of the geeks in Tokyo. There is a strong geek subculture here and that is where they all hang out. It’s even referred to as the “geek ghetto”. There are supposed to be a lot of cafes and such where girls dressed in maid outfits will greet you at the door by saying “Welcome home, master.” which I guess is pretty nice if you are still a virgin. I didn’t see any of those places but I didn’t stay very long. I can only handle so many shopping districts per vacation and I am about burned out. So that was yesterday. 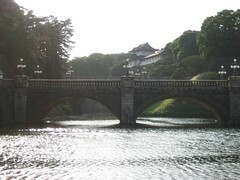 Today I lounged around quite a bit and then finally headed out to see the Imperial Palace. I’ve never seen Central Park in New York, but I would guess you get a similar feeling when you first see it. You have this giant city with skyscrapers as far as the eye can see and then a beautiful park right in the middle of it all. 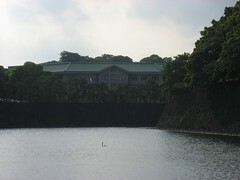 Although I bet the Imperial Palace has more moats. It’s really beautiful, and very serene. Unfortunately the palace proper is closed to the public all year except for two days but you can walk around the gardens and see the outlying areas. The only part that is open year round to the public is the East Gardens, but they close at 4pm and I got there too late. I will probably go back tomorrow to see it. On the way home from the palace I stopped at Ueno, which is the closest large station to me. I had been wandering around starving for the past 4 hours or so and was hoping Ueno would have a restaurant with the proper mix of no-raw-eggyness and approachability. I was right! I found a nice little place called KFC and had a really good meal of chicken and fries with no raw eggs anywhere! I feel really bad about the state of my diet here so far. The only stuff I have eaten is stuff I bought at the grocery store, or from bakeries or western fast food. My only excuse is fear. A lot of the food just looks scary as hell to me. I’m not really kidding very much about the raw eggs, and everything contains sea food, which I am not a huge fan of. I will not leave Japan without getting comfortable eating it’s food, but it might not happen in Tokyo 🙂 The only thing that makes me feel better about it is that I’ve had trouble going out to eat in every large metro I’ve been in. The crowds are unbelievable and I don’t want to hold things up and cause problems. I am hoping that when I get away from the city a bit I will find it easier to try to blend. So that’s about it for the past few days. Tomorrow I am going to try to get up early(er) and see the east gardens of the palace, and if I get up super early, maybe the Tsukiji Fish Market, which is the largest fish market in the world. Each morning they auction off the freshest fish to be used for all the day’s sushi and it’s supposed to be incredible to see. Tonight was supposed to be my last night in this hotel, but I booked another 3 nights. I was going to move downtown and into a more communal hostel to try to meet some people but the prices are stupid. I can stay here where my private room is awesome or I can move into an 8 bunk dorm and pay more for the privilege. Unless plans change I intend to head for Kyoto mid-week. 1–No Japanese hair band can beat the Elvis wanna be midget singing gospel songs and you know it. 2–You said yourself that you were going to expand your food tastes on this trip and it seems like you aren’t being very adventerous. I mean, have you tried a raw egg? How do you know you won’t like it? It could be better than NJ pizza for all you know. 3–What is it with you and the red light districts? I know a lot of people, including myself, who have managed around many foreign countries and never even seen a red traffic light, let alone a whole district. Perhaps you should buy better maps. You should go to a Japanese tatoo parlor. Ask for a devil, a nun, and a bottle of jack daniels. Jason at the tatoo parlor, don’t forget the joint. I’m still trying to figure out why the “Welcome Master” thing is only good for virgins. Well anyway, I take off on MONDAY. I’m happy, nervous and OMG everything!! Um Idk, if you want me to still call you or not. So either you call me or I guess I might on Sunday. Well Sorry if Im uhh being annoying. Ya Im at school because my computer is messed up again. Why don’t you geotag your photos on flickr? Their map is great! I think you should take a one week Japanese language course at one of those total immersion schools for English speakers. It might make things less intimidating.